MITZPE RAMON, ISRAEL–Today Team Israel 2013 had its last visit to Makhtesh Gadol, marking the end of Lizzie Reinthal’s and Steph Bosch’s fieldwork. We collected our last specimens from the Matmor Formation, which is exposed only in the center of this magnificent structure. 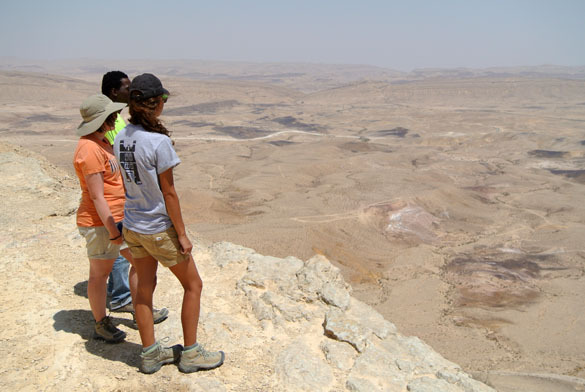 The students above are looking down into the northern part of the makhtesh from the viewpoint at Mount Avnon. This is a view from the same spot looking south along the western wall of the makhtesh. 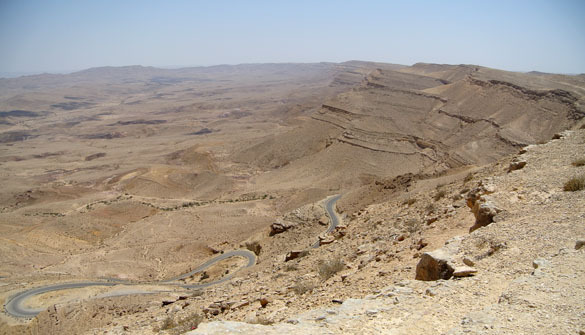 You can see a bit of the curvy, narrow road below that we used to enter and exit the makhtesh. This road was built by the British during World War II when they thought there might be oil underneath this breached anticline. 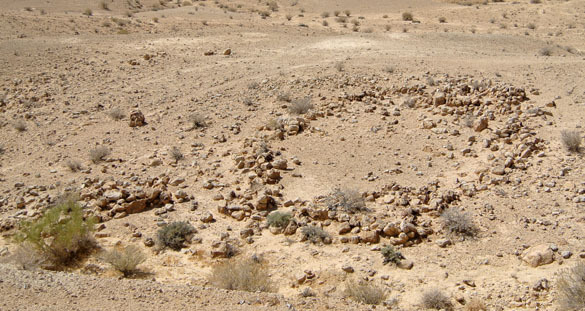 This ring of stones is the remnant of a Bronze Age livestock pen, along with a probable small shelter for the shepherd in the lower left. This features are found throughout Makhtesh Gadol, usually up on the flanks of the walls or the Matmor Hills. I happened to come across this one in today’s walkabout. 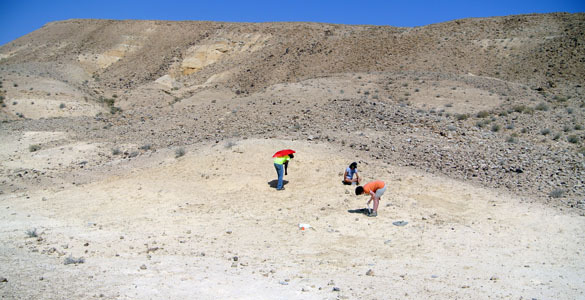 Finally, here are students collecting at our last site — the southernmost exposure of the echinoderm-rich subunit we’ve found to be so productive. This morning we found … wait for it … two more bryozoans! This is usually not big news in most of the places I’ve worked, but it sure is here. They are again runner-types, but not Stomatopora. Much more to report on these after we get back home with them. We still have five more working days in Israel. One will be devoted to finishing Oscar’s fieldwork, one to finishing smaller projects in the Makhtesh Ramon area, one to exploration of geological sites Yoav has chosen for us, one for a trip to Jerusalem and the headquarters of the Geological Survey of Israel, and a final day to make sure we’ve done all we came to do. Runners but not Stomatopora. I’m intrigued. Could they even be cheilostomes? If so you may have found the Holy Grail in the Holy Land. All possibilities are open, Paul. I’m not doing my usual leap to conclusions until I get these puppies under a microscope. They are tiny. Wish I could do better with my handlens under the desert sun!